Enjoy a ‘A Little Night Music’ at ‘First Friday’ in Chester Tonight, 5-8pm! You are here: Home / Towns / Chester / Enjoy a ‘A Little Night Music’ at ‘First Friday’ in Chester Tonight, 5-8pm! CHESTER – A Little Night Music will greet visitors to First Friday, Aug.4, when singers, bands, modern dancers and even a bagpiper will play outdoors in the downtown while shops, restaurants and galleries stay open late with art openings, new jewelry lines and summer sales. Leif Nilsson’s band Arrowsmith will play from 5 to 8 p.m. on the porch at Leif Nilsson’s Spring Street Studio and Gallery; inside, Leif’s latest paintings will be on display. At Maple and Main Gallery, Dan Nichols, one of the gallery artists, will be wearing his kilt and playing his bagpipes on the porch. The opening party for “Earth and Air,” a show of Michael DiGiorgio’s bird paintings and Betsy Himmelman’s ceramic vessels will be from 6 to 8 p.m.in Maple and Main’s Stone Gallery. Dancers from the River Valley Dance Project will perform at ‘Lark’ this evening. The Gusto Dance Project collaborating with River Valley Dance Project will be performing on the lawn outside Lark; if the mood suits them they may dance through town as well. Lark is featuring painted signs by Jennifer Burr and necklaces from Kenya. 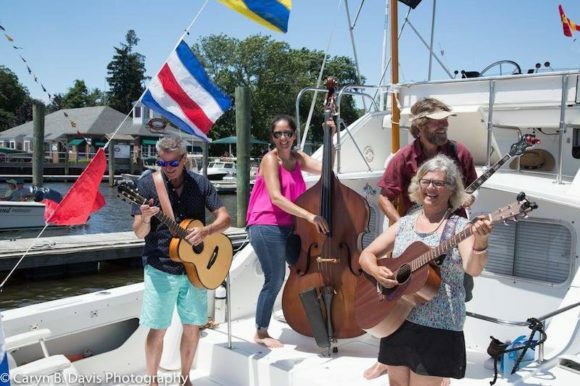 Performing in front of The Perfect Pear beginning at 6 p.m., Connecticut College senior and Deep River native Julia Tackett will be playing the guitar and singing. The Perfect Pear is also introducing its “Back to School” specials Friday and serving samples of lavender lemonade. And, at The Pattaconk, the rock band, The Instagaters will play from 7 to 10 p.m.
‘Stingray’ by Clare Gustafson is one of the featured pieces of the artist’s work on show at Lori Warner Gallery. 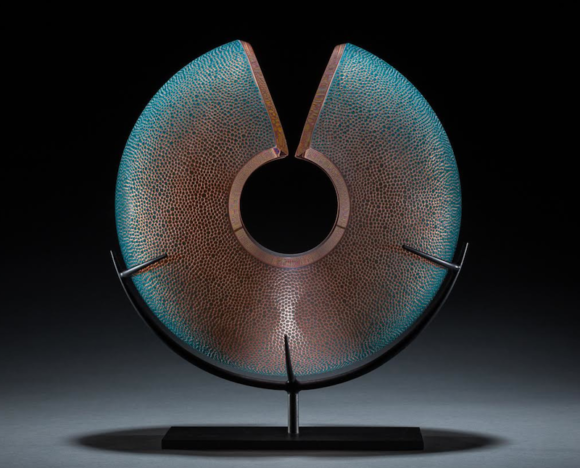 Friday will kick off the opening of Weekend of Diamonds with Mandy Carroll-Leiva as well as new glass by Carrie Gustafson and a new series of monotypes by Lori Warner at Lori Warner Gallery. Chester’s Finders Marketplace, a new enterprise on Rte. 154 across from the entrance to Main Street, will be joining first Friday with light cocktails and snacks. At C&G the start of the shop’s 40 percent off August sale of summer hats, sandals and select apparel will begin Friday evening. Sales items on the porch Friday are an additional 10 per cent off. Dina Varano Gallery will be presenting new jewelry designs by Dina and nature-inspired tabletop designs by Michael Aram. The gallery will also be offering a refreshing beverage in celebration of this town-wide festive evening. The French Hen will be serving guests spiked lemonade and sales on summer décor.